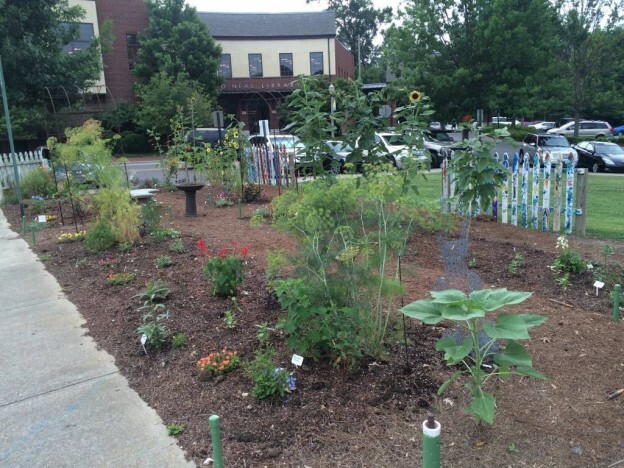 Just about this time last year we planted the community garden across the street with flowers to attract bees, butterflies and other pollinators. The two years previous it had been a vegetable garden, though the first year of veggies turned out a bit better than the second. Regardless, this little plot of land has had a lot growing in it! By the end of summer I’d begun calling it the ‘Better Late than Never Garden’, and it’s certainly been a lesson to many in the neighborhood that a garden can be started any time of the year with care and attention. I think the zinnias and other heat loving plants performed as well, or better, than if they’d been put in the ground 2 months earlier. In fact, I’d probably be pulling a few out right about now! When the summer seeds arrived early this spring, I perused the seed rack, choosing a good assortment of sunflowers and zinnias since they’d done so well last year. I squirreled them away and took them home, knowing it would be months before they’d be planted. 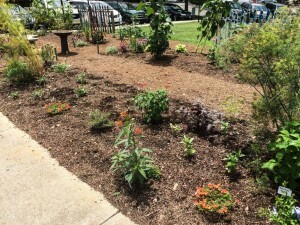 Finally, the other day I brought all the packets back, walked across the street, and laid them out on the ground in the four planting beds, randomly choosing spots I thought might work well between the various groupings of plants already in the ground. I thought I’d picked the perfect day, since there was a good chance of rain that afternoon and for the next few days as well. I’d been sure to set aside some packs of tithonia, the beautiful orange mexican sunflower too, and picked a spot in the garden for some, though there already were plants growing in random spots that had seeded from last year. What a happy surprise that’s been! I’ve left them to grow in the spots they’ve picked and know the monarch butterflies will appreciate them again in late summer. One flower I thought there’d be plenty of, because it’s a notorious reseeder, is the beautiful cleome or spider flower. I’ve been disappointed to find only one plant coming in the spot it was last year though. After giving it some thought, I’m sure the reason no seeds that might have fallen to the ground germinated was the heavy layer of pinestraw mulch I used in the winter garden. It was great for the pansies, snapdragons and foxglove but must have smothered any seeds that tried to come up through it. Working my way through the beds one at a time, I used my pick to loosen the soil and make shallow trenches. Most rows were planted 1/4″ or so deep, lightly sprinkled out, and then the soil gently pushed back. 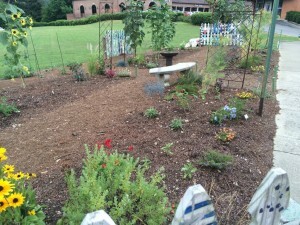 After all the seeds packets were opened and planted, the beds were lightly watered. Remember I said rain was forecast that afternoon? Well, it turned out to be an absolute gullywasher. I watched the rainstorm through the doors to the greenhouse, wondering if any of the seeds I’d just planted would still be in the same spot. Only time would tell, I thought. The zinnia and sunflower seeds are coming up…. There are at least 6 different varieties of zinnia and as many sunflowers planted in the four beds, and, if last year is any indication, the garden will be an explosion of color in another month or so and the bees and butterflies will be enjoying the patch of blooms in the middle of the village. 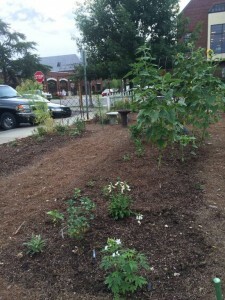 The hyacinth bean vine has been replanted too, on the first arbor closest to the sidewalk. The seeds were soaked overnight to soften them and planted all along the length of the arbor on both sides. Luckily the torrential downpour didn’t wash all the seeds away and the zinnias, sunflowers, and hyacinth bean vine seeds are already coming up. Now the smallest plants will need to be taken out so they’re not too crowded. Crowding of tiny plants isn’t good, and none will be very strong if they’re left too long. This is called thinning and, hard as it is to do, is a necessary step to a beautiful garden. 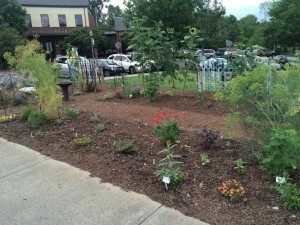 This entry was posted in community garden, Flowers, Planting Tips and tagged better late than never garden, community garden, cutting zinnias, seeds, sunflowers, tough annuals for sunny spots on July 3, 2015 by Kris Blevons.